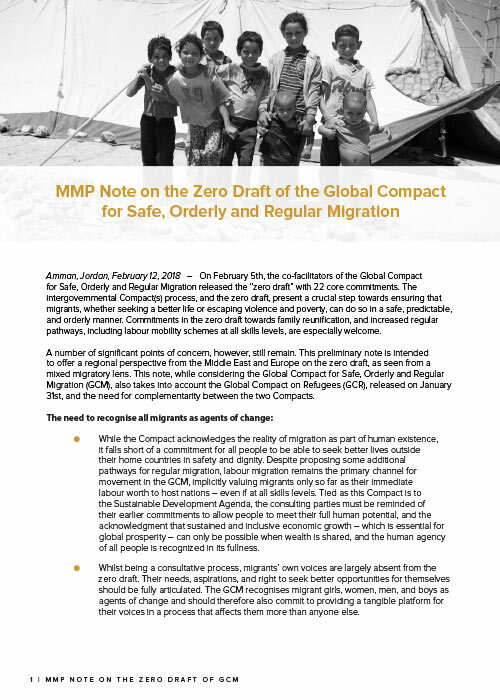 On February 5th 2018, the co-facilitators of the Global Compact for Safe, Orderly and Regular Migration released the “zero draft” with 22 core commitments. The intergovernmental Compact(s) process, and the zero draft, present a crucial step towards ensuring that migrants, whether seeking a better life or escaping violence and poverty, can do so in a safe, predictable, and orderly manner. Commitments in the zero draft towards family reunification, and increased regular pathways, including labour mobility schemes at all skills levels, are especially welcome. A number of significant points of concern, however, still remain. This preliminary note is intended to offer a regional perspective from the Middle East and Europe on the zero draft, as seen from a mixed migratory lens. This note, while considering the Global Compact for Safe, Orderly and Regular Migration (GCM), also takes into account the Global Compact on Refugees (GCR), released on January 31st, and the need for complementarity between the two Compacts.